How tall is Dwayne Johnson? Dwayne Douglas Johnson was born in Hayward, California, USA (May 2, 1972). He is also professional wrestler in the WWE. The Rock is his ring name. Dwayne Johnson won seven times WWE World Champion. Dwayne Johnson with Bruce Willis and Adrianne Palicki in G.I. Joe: Retaliation (2013). 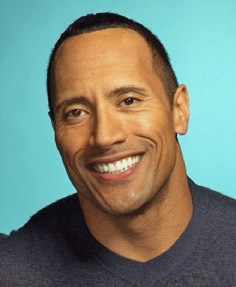 Dwayne Johnson was married to Dany Garcia (1997-2007). The couple have a daughter named Simone Alexander Johnson born August 14, 2001. Soon he began dating Lauren Hashian. They have two daughters daughter Jasmine (b. 2015) and Tiana Gia (b. 2018). In recent years, Dwayne Johnson has become a rising star of action movies. Especially with Fast and Furious, Driver,Snitch,Pain & Gain,Empire State,G.I. Joe: Retaliation.